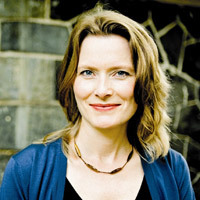 Jennifer Egan: Your royal carriage is waiting. Egan’s A Visit from the Goon Squad recently won The Pulitzer Prize, The National Book Critics Circle Award, and the L.A. Times Award for fiction, a trifecta instantly anointing her the status of literary nobility. So when Egan appeared on the “Fiction: Breaking Boundaries” panel at the L.A. Times Festival of Books at USC on Saturday morning, the intense interest from the audience was palpable. “I feel kind of bad for the other writers because we’re all here to see Jennifer Egan,” someone whispered in the row behind me as the panelists entered the auditorium. Hey, bookworms, there were plenty of other notable guests at the party, too. Egan (who entered USC’s Taper Hall auditorium smiling in a casual T-shirt with a brown backpack slung over her shoulder) is certainly a worthy object of admiration, but her co-panelists were wildly interesting as well—“wild” being the operative word, here, as fellow panelist Benjamin Hale’s book, The Evolution of Bruno Littlemore, is narrated by a chimp. Olga Grushin’s book, The Line, includes a character that refuses to speak, and Frederick Reiken’s book, Day for Night, has ten distinct narrators. Moderator Richard Raynor (A Bright and Guilty Place) suggested that the common thread among the panelists is that their novels “don’t behave like novels.” Egan refused the “novel” label for her hardcover edition, and Raynor put to the authors the question of novelistic form. Egan began working on her story in parts, then realized the fracturing was a necessary component for her theme. “Oh, man, this is going to be a nightmare to sell,” she recalls thinking. After it did sell, she threw her Knopf editors a (now famous) curve ball by asking if they could help her integrate a new chapter organized like a PowerPoint presentation. The structure of the computer program appealed to her, she explained on Saturday, because of the way it matched the structure of her book, “discreet moments of experience with gaps in between.” Her editors were game. Liminal spaces are also significant for Reiken, whose intricate collection of linked stories was inspired by the historical event in which 500 Jewish academics were executed during the Holocaust. Grushin’s novel also was inspired by a historical event, the 1962 Igor Stravinsky concert in Leningrad for which people waited in line for a year. “The question was, What would make you stand in line for a year? What is essential?” she asked. It was a pertinent question for the Festival of Books itself. The event changed venues this year after being staged at UCLA since 1995. Attendance figures were not released, but organizers expected 150,000, and the crowd at USC certainly seemed hefty. Traffic was snagged a bit with two events in Exposition Park this weekend (the March of Dimes Walk for Babies on Saturday and a Cinco de Mayo event on Sunday). As for the event’s new digs? I think I can bill myself as a fair-minded observer of both campuses after having earned English degrees from both schools (I was a Bruin undergraduate and a Trojan grad student). In my mind, nothing can beat the pastoral grandeur of UCLA’s campus, but the sprawling grounds (and hills) sometimes made visiting the far-flung exhibitor tents and panels a bit arduous. The festival felt a tad more cohesive at USC, and also decidedly more urban. Classrooms on both campuses hold memories for me, but one auditorium I had never entered before this weekend was in USC’s Seeley G. Mudd building, which houses the chemistry and physics departments. Luckily, Oren Harman, chair of the Graduate Program in Science Technology at Tel Aviv’s Bar Ilan University, is a man who knows his way around a science hall. Even though the lights kept turning off in the auditorium, Harman gave an energetic talk as part of the “Science: Behind the Microscope” panel on Saturday. Harman’s recent book, The Price of Altruism: George Price and the Search for the Origins of Kindness, won the L.A. Times Book Prize for Science and Technology Friday night, and Harman’s enthusiastic talk about his subject went far toward suggesting why. If Charles Darwin’s theories suggest that evolution is a game of survival of the fittest, Harman began, then how do we explain the existence of kindness in the world? Nature abounds with altruistic acts. Harman’s book is about the man who solved this conundrum, George Price, an eccentric whose mathematical equation expressed the idea that kindness is ultimately self-interested. Price was devastated by the implications of his own theory, becoming an evangelical Christian and giving all his possessions away in order to prove the possibility of selfless benevolence. In the end, Price became homeless and committed suicide. Harman’s book places Price’s life story in a scientific and social context. Speaking of art, my daughter and I hit the Target Children’s Activity on Sunday, a tent in which kids were coloring booklets and cheerful workers were taping their masterpieces to the wall. My daughter’s “outer space” drawing depicted a blue planet holding a book up for a little girl, “so she can read,” my daughter explained, “and she doesn’t need to hold onto the book” (a kind of gallactic e-reader: genius). I also took my daughter to see Mo Willems on the Target Children’s Stage on Sunday. The popular Willems read I Broke My Trunk! from his “Elephant & Piggie” Easy Reader series which, he joked, should really be called “Hard to Write Readers,” because you can only use about 40 words. My daughter and I are now both now eagerly anticipating Willems’s forthcoming book about a great moral dilemma: Should I Share my Ice Cream? (June). Speaking of ice cream, we’d seen the tweets all weekend about the free frozen treat, and decided to track it down. Not far away from the children’s area, there it was like the pot at the end of the rainbow: a giant and merrily decorated Ben & Jerry’s truck. We joyfully accepted the goods and wandered toward the exit, digging in with our miniature spoons. Heat, as usual at the festival, was a factor all weekend. The reflecting pool in Martens Plaza was a big hit with kids on Saturday, but it was turned off on Sunday, and the water elements= would have provided a nice psychological break, at least, from the high temperatures. Before my daughter and I left, we stood on the cool second floor of Leavey Library for a moment, looking back over the tents and festival-goers in USC’s McCarthy Quad. Looking out the library window at the crowds, my spirits were buoyed about the future of books, and I was ecstatic about the air-conditioning. Next articleGordon Ramsay Vs. Every Other Restaurant in L.A.